Trenton, NJ — Well-known cannabis advocate, Ed Forchion, aka NJ Weedman, conducted a peaceful act of disobedience this week and quickly became the subject of a viral video after he went to the New Jersey Statehouse and took to selling and smoking cannabis. Although New Jersey is currently pushing a law through the legislature to legalize recreational marijuana statewide, the plant is currently illegal and cops will throw you in jail for possessing it. Despite the state Attorney General pausing the prosecution of marijuana related offenses in July, law enforcement was quick to respond by promising to still arrest people. The attorney general’s statement “does not affect the current laws pertaining to police officers,” said Anthony F. Ambrose, public safety director for the city of Newark. 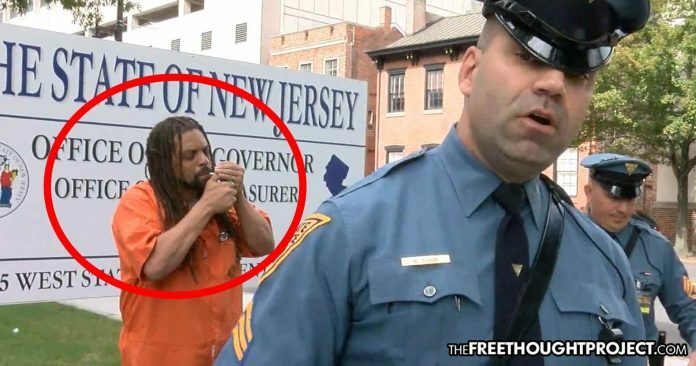 So, when NJ Weedman took to the front of the state house and fired up a joint in front of cops — while selling homegrown marijuana plants in the process — he knew it would be likely for him to be arrested. Instead, however, thanks to a shift in the current paradigm, he came out with no handcuffs. With multiple cops only feet away from Forchion, he sold marijuana to a dozen people in front of the government building—a entirely illegal act. Then, as app.com reports, in front of Gov. Phil Murphy’s office, Forchion lit up a joint as a state trooper watched him. The trooper did not arrest or cite Forchion, but rousted the activist and about a dozen others in his entourage from outside the governor’s office to a spot down the street. Forchion wore an orange “Mercer County Correctional Center” jumpsuit. Forchion practically dared the troopers to arrest him, while others in his entourage urged him to comply with orders. Forchion has been free for just four months after more than a year in prison for a case that stemmed from an investigation of his Trenton restaurant, NJWeedman’s Joint, that police suspected as a hub for drug sales. Prosecutors charged Forchion with witness tampering for alleged threats he made against a confidential informant who had helped police. Forchion is no stranger to controversy and bucking the system. He became famous during the closing arguments of his 2012 trial, as he wore a shirt that said “Marijuana … It’s OK. It’s Just Illegal,” and told the jury that he had been munching on edibles throughout the whole trial. In the years since the 2012 trial, Forchion has faced constant harassment from the authorities and has been arrested on numerous occasions. Luckily, he was still able to win over the jury earlier this year when he was found not guilty after spending over 400 days in jail on trumped-up witness tampering charges, which were related to a prior marijuana case. Forchion epitomizes how peaceful change is brought about—when good people break bad laws. Peaceful disobedience has been the driving force behind so many positive changes in America and Forchion is unafraid of sacrificing his freedom to fight for what he knows is right. Forchion was willing to get arrested but the police knew that if they arrested him, they would look like the bad guys. This is what incites positive change. Once immoral laws are exposed, it becomes immoral to enforce them. Thank you Ed Forchion for being so willing to sacrifice yourself so that others are not kidnapped and caged for ingesting a plant that makes them happy.